I have traveled from General Santo in Mindanao Philippines to Tupi, Philippines; it is about one hour trip to the north. I asked many people on the bus from General Santos to Marbel, if there was a Hotel in Tupi. The man next to me said there was a short-term hotel; however, he did not think there were any others. I kept at the bus attendant or the person who collected my bus fare money, and even though he did not speak English well, he did understand and helped me. The bus driver, and the attendant would not let me de-board, or kept me on the bus in Tupi, in a nice way until they could take me back on the highway and to a hotel or motel called the 3 Inn or 3 Mile Inn or something just north of Tupi. Sometimes help is worst than no help, they were very intent on helping me to find a hotel, so they dropped me off at the hotel, and saved me a taxi fare. I get out of the bus, and I realized, there is no easy way to return to the city or village of Tupi. That Inn is a motel; you need a car to go to this hotel. I did not even enter the hotel and ask; I just walked to the other side of the road and waited for a taxi, there is no taxis, however, soon a bus stops and takes me back to Tupi. I asked a taxi driver or trike taxi for a hotel, he points at the Catholic Church, and I walked back behind the church. I ask around and the son of the small store walks me over to this very large home. Jo Jo comes to the gate, and walks me up to a room. 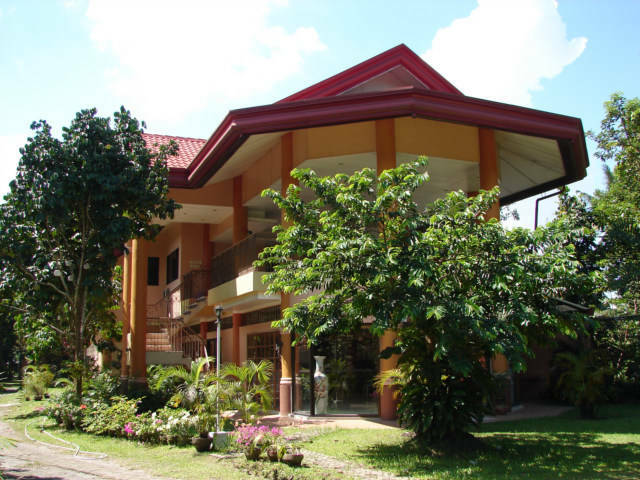 I am in some paradise house, with a room for 600 pesos, about 12 dollars US, Air Conditioning, private bath and a TV outside the room with cable and HBO, CNN, and all the TV stations I did not have in the T’boli in General Santos. The room is probably one of the best I have had in the Philippine and less than most in cost. It is next to the protestant Alliance Church or across the street, it is a great place. Last night was Jo Joe’s birthday, and they cooked or roasted a pig, he came up and retrieved me, I went down and ate rice, pig, and a very chocolate piece of cake. Tupi is a quiet place; they keep asking me if I am afraid, there is for sure a notice in this area to be careful of terrorist or conflicts.